The drugs were seized at sea between Dec. 20-22. 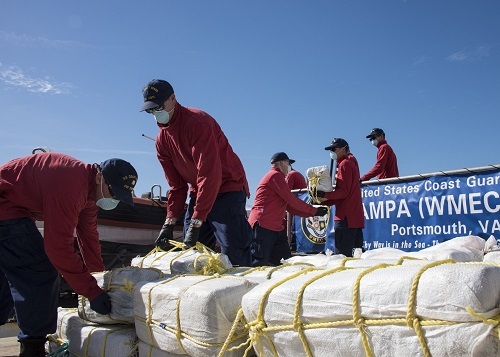 ST. PETERSBURG – The crew of the Coast Guard Cutter Tampa today (Feb. 2) unloaded in St. Petersburg nearly two tons of cocaine that was seized in the Caribbean Sea. While patrolling in support of Operation Unified Resolve and Operation Martillo, about 1,580 kgs of cocaine were seized, worth $46,681,100wholesale, by the U.S. Coast Guard and partner nation crews between Dec. 20-22. Netherlands Navy ship, operating in the Caribbean. Operation Unified Resolve is a combined effort between the Coast Guard and international partners in the Caribbean region to deter illicit activity and interdict vessels smuggling drugs and illegal migrants to the U.S. Operation Martillo is Joint Interagency Task Force South-led, multinational detection, monitoring and interdiction operation conducted by the U.S. Navy, Coast Guard , and Customs and Border Protection vessels andaircraft working in cooperation with military and law enforcement agencies from various Central and South American nations, Canada, the United Kingdom and the Netherlands. 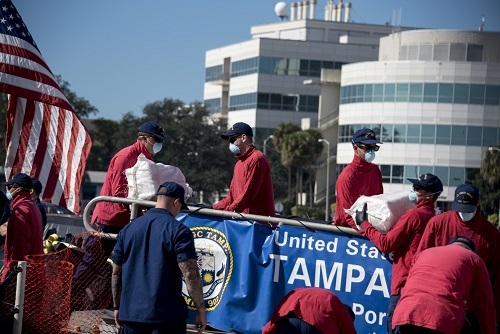 Tampa‘s primary missions include counter-drug and migrant interdiction operations, search and rescue, national defense, and international engagement. This cutter is the fourth Coast Guard cutter to bear the name “Tampa,” and named in honor of the USS Tampa that was sunk by a German U-Boat during World War I. The crew will participate in the dedication of a mural commemorating the 100th anniversary of sinking of the original cutter at the Tampa Bay History Center 1t 10 a.m. Saturday (Feb. 3). Main photo shows a crewmember aboard the Coast Guard Cutter Tampa helping his crew during the offload of about two tons of cocaine today (Feb 2) in St. Petersburg. Photos courtesy of the U.S. Coast Guard.